I never would have been able to break away from my meat-centric view of dinner if it had not been for some good recipes. When I first started cooking on a regular basis (which not coincidentally, was when I moved out of my parent's house), I had the good fortune of receiving some excellent recipes from my friend John. Many of these recipes introduced me to exotic (at least to me at the time) ingredients like turmeric and bulgur, as well as such cooking concepts as different textures in food and brightening up flavors with acids at the end of cooking. More importantly they broke me out of my narrow cooking frame of reference. Recipes that I would have dismissed out of hand before because I thought they had strange flavor combinations or unfamiliar ingredients I was now ready to accept and try. I was fortunate to have such a good influence during my formative cooking period. Since that time I've come to know John as a food lover on par with myself (and more so in some respects). Somebody who appreciates well-made food, who really considers ingredients and the effects they have on a finished dish, and who is willing to give almost anything a try. From him I picked up the idea that cooking is much more than simply being able to follow a recipe, that the more command you have over ingredients and techniques, the more likely you are to prepare excellent food to your particular tastes. He also showed me that it is possible to tackle seemingly long or complex preparations at home if you're just willing to try (and that it is often worth the time to do so). John has passed more than a few good recipes my way over the past 7 years, but some of those originals are still staples in my repertoire, and none more so than Red, Gold, Black, and Green Chili. When it comes to healthy eating, it's tough to beat this chili. It's loaded with vegetables (green peppers, tomatoes, and corn), whole grain (bulgur wheat), and protein (red and black beans), and most importantly, it tastes so good, you won't miss the meat (and neither will your heart). It even looks amazing. 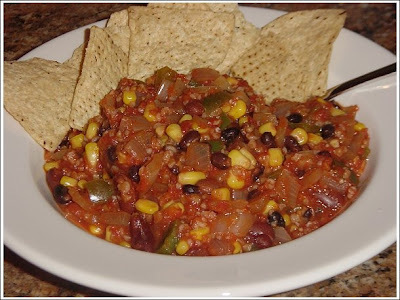 This chili is easy enough to make on a weeknight, as it comes together very quickly once the chopping is done and the cooking starts, but why not make it on the weekend so it can sit a few days and get even better? Make it Sunday morning, eat it 2 times for dinner during the week, or take it for lunch. Put leftovers into a tortilla for a quick burrito, or put a little in the middle of an omelet for something different. I've adapted this recipe slightly over the years to get it just how I like it, and that's the way I'll present it here, but nothing is set in stone (especially spice types and amounts) so feel free to experiment. The recipe begins with mise en place. Peel, seed, and chop everything, measure out your bulgur, spices, and water, rinse and drain the beans, then get the bulgur cooking. Heat the oil in a large pot and then add the onions, garlic, and spices. The recipe calls for 1/4 teaspoon of cayenne pepper, which gives a mild but noticeable heat that builds as you eat. If you like spicy chili, I would increase it to 1/2 teaspoon. Cook, stirring occasionally, until the onions begin to soften, about 5 or 6 minutes. Add the green peppers and cook for 2 minutes then stir in the tomatoes. The original recipe called for a can of chopped tomatoes but I use crushed because I like the chili to be a little more saucy. If you'd prefer less sauce, and more chunks of vegetables, by all means use chopped tomatoes (and if you're making this in the summer, buy some fresh tomatoes and forgo the can altogether). Stir in the corn and beans, and check the bulgur (which should be cooked but still a bit chewy at this point). Add the bulgur to the pot, stir and gently heat everything a few minutes to combine all the flavors. Add salt to taste (I usually don't add any, but when I do, I start with 1/2 tsp and go from there). The chili is good by itself (and healthiest), but it certainly can be dressed up however you like. Cheese, sour cream, chopped fresh jalapenos or onions, or some lime juice would all be good additions. Regardless of what I put on top, I like to serve it with a few tortilla chips. Your chili looks great! I like the addition of corn, bulgur. 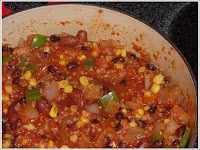 My husband loves chili - I'm going to make your recipe this weekend. I'm making this chili Sunday for the two night supper precursor. I can't wait to try it!! !